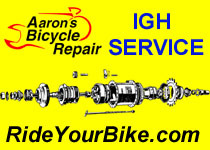 Spareparts and used hubs (German): Jens Hansen is another reference concerning Fichtel & Sachs, SRAM and Shimano hubs. Probably you need to adjust the indicator chain tension. The Sram manual says the chain should be ‘taut’. In the case of my T3 hub, this means 2.5 outer chain links should stick out of the pulley housing in 1st gear. Today, I broke the second axle of my SRAM i-MOTION 3. It lasted a full 2 weeks. This is somewhat better than the 4 days the first installment has lasted. I have been using F&S Torpedo 3-speeds for over 30 years and never had anything like this. The roads have not changed in the past weeks, nor have I. There must be someting fundamentally wrong with this design. bad Quality. Forget it , just buy spare and replace. Knut – thats very intriguing about the broken axles. Could you put up some photos of the broken parts? Something seems to be very wrong – thanks for the update though. The hub made a round trip to the SRAM (former Fichtel&Sachs) facility in Schweinfurt, Germany. Came back with the comment, that a piece of the axle was manufacuterd out of spec, probably leaving it vulnerable to breaking. Repaired free of charge. They had not seen the first one. At least they did not admit. I had contacted SRAM by email and got immediate response and a phone call, asking for the bike to be returned to them through the dealer. Shipping and all else was taken care of by them. Bottom line. Customer care of SRAM is ok. They do have a manufacturing problem that most likely affects more than just the two hubs that I have seen. So watch out for T3 hubs with manufactue dates around early 2009. I was just cleaning out my bike parts box and found an old F&S Torpedo 3-speed hub with coaster brake plus some tools and spares for such hubs. I don’t think I will ever use these things so whoever pays me the shipping shall have it. Total weight is less than 2kg, within Germany that comes down to EUR 3.90 (small parcel = Paeckchen), international is more (check DHL.de). The hub is the real old one designed to be used with an oiler (mit Oelnippel). It reads “515” on the body and accepts 36 spokes. A 19-tooth sprocket is attached. It was between 1980 and 1990 when I put this hub into the box, and I had salvaged it from what was an older bike back then. It tested OK at that time. Martin– with the old F&S– still have that stuff? I have a few old and trashed hubs, and could really use parts. If so, send me an e-mail– threespeednerd@gmail.com. Thanks. Haven’t received any reply to my mails, putting it on EBAY now. For some reason I haven’t got any. Well, try again I suppose. Does anyone know the size of bearing balls used in a Spectro T3? They seem to be an obscure metric size, in between 3/16″ and 1/4″. Hi, if the ball is between 3/16″ and 1/4″ it is 7/32″. It is a less common size today, but decades ago it was used in campagnolo freewheel hubs, some sturmey archer hubs and in your case Spectro (which was developed from Sachs) hubs, among others. Some headsets use/used that size too. If your LBS doesn’t have any, they can easily order you a quantity. Hope this helps, keep your Spectro rolling! Thanks! I had to dig the old ones out from the depths of the bin, but it’s relatively easy to replace the balls without stripping the whole hub again. I swapped the hub shell/ cones/ axelnuts and washers between a Sachs Dreigang (model515) w/coaster and a Sram T3 w/no brake. The only difference I found was with the bearing ring sizes and their cones. Both axles have 10.5 FG thread, so I think that in most cases if you swap a T3 axle for a Sachs axle of the same type (coaster/ drum/ no brake) you should be good. In my research I found Sram CS, Bike Friday, Petra Cycles and Yellow Jersey most helpful. As I’m sure you know, the Sachs and older Sram parts are more available in UK and Europe. Hello! I´m wondering about how long time the Torpedo 415 was manufactured. I have a Bendix Torpedo tricoaster that is identical to a F&S hub, but i’m not sure what one… i could be one of two F&S hubs. it has no model number on it. does anybody know which hub this is? I’m looking for the part that connects an old t3 toggle chain to the gear cable (barrel adjuster?). The current version of this part does not fit. Does anybody have any info on this part and where I can get it? +1 I just bought a torpedo dreigang 3 speed/coaster hub. I also need the cable adapter that connects to the toggle chain. Do you mean the part that connects the indicator chain to the shift cable—what you call the “barrel adjuster” (Sram calls this the “Locating Sleeve” and many US supply call this a “quick connector”) It is a small black plastic box with a metal button to release the chain. When I got mine, I found that the T3 connector fit my Dreigang indicator chain (eventhough my chain is smaller than the T3 version.) I did have to push the Dreigang chain into the sleeve much further to get it to catch and hold. If you need a T3 (Locating Sleeve/quick connector), Yellow Jersey emailed me that they have them. hi all. I just purchased a used Swobo Otis with a SRAM i-Motion 3 coaster brake version. Other than hating the coaster brake alltogether (i got a deal and i needed a new bike as my previous bike was stolen) — I am wondering how to service this thing and make sure its ship shape at all times. The first thing I noticed is that it makes clicking sounds in 2 and 3 while pedaling, but is silent in 1. Is this normal? I also am not crazy about the grip shifter, and this one is a little banged up, so it seems adjustments are funny. Any source for a replacement would be nice. Are there any videos on youtube of people servicing these hubs and adjusting them, etc? I didnt see too many. Anyway, If I get a spare day and some good guidance, I’ll be happy to document my hub servicing. I hope to give it an oil bath if that’s the way it goes with this model. Otherwise, I’m just wondering if I can adjust the coaster brake to engage at an angle beyond 90 degrees. Like further down instead of so high. I would love to take this brake off entirely, if that’s possible. I should add that after further inspection, everything works fine in 1 and 2, but in 3 there is a distinct clicking while both pedaling and while coasting – it’s not nuanced in the least — its there. Is something wrong in there? How can I adjust this thing and care for it? coming out. This is a very Bad Design from SRAM. Compression Coil Spring it wont cause such problem. the bigger Diameter Coil Spring ). mentioned then it was solved. Hub and add grease again. Have you had a chance to do this? I’d love to hear more; I’ve got what looks to be a dying T3 in a folding bike, and I have to decide whether to repair or replace. More info about the guts of 3-speed hubs would help me quite a bit. Hi, my wife’s Batavus has a T3 (maybe 15 years old) and it was constantly jumping in 3rd and would then revert to 2nd. I opened it all up, stripped and cleaned it (the oil and grease were heavily varnished), oiled it and reassembled. There didn’t appear to be any badly warn parts. It’s running fine in 1st and 2nd, but the problem with 3rd is still the same. The control chain is fully slack in 3rd, so it’s not the cable. they are funny things. I have some issues with mine now and again. I want to upgrade to an 8-9 speed, but not comfy with working on this one. Download the manual and check out the Yahoo group. Hello, does anybody know how to remove the planetary gears from the planetary carrier of a H3111 hub (Torpedo 3-speed)? The axles of the gears are held in place by a thin conical metal sheet which I cannot remove. If no part damage , no need to remove. Clean it well by kerocine , dry it properly. Then apply Lubricat Oil on bush bearings.